The ADEA Advocacy website is a new tool that gives you comprehensive information on issues of importance to academic dentistry and dental and craniofacial research. ADEA’s Advocacy and Governmental Relations portfolio (AGR) is offering its ADEA Advocacy Workshop series to ADEA members. ADEA has developed a State Advocacy Toolkit, enabling members to more effectively advocate for dental education and dental and craniofacial research. 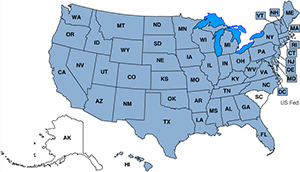 The ADEA United States Interactive Legislative Tracking Map now features a new dropdown menu, allowing ADEA members even easier access to critical state legislation. This one-day event has been designed to provide the dental education and dental and craniofacial research communities an opportunity to advocate before Congress in support of our issues. ADEA is pleased to announce that the new ADEA United States Interactive Legislative Tracking Map is now available to provide members access to the most up-to-date information on state legislation of interest to academic dentistry.